Yes! This is undoubtedly the best Stereophonics site on the net! This is a basic tribute to the greatest band that ever lived, certainly the best Welsh musicians that have ever lived (better than the Manics and Catatonia!). 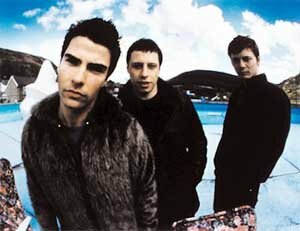 The Stereophonics are Kelly Jones, Richard Jones (no relation to Kelly) and Stuart Cable. They have newly released the class album 'Performance and Cocktails', containing the hit singles 'The Bartender and the thief', 'Just Looking', and the newest single 'Pick a Part that's New'. Also, new out and gunning for no.1 is 'I wouldn't believe your radio'. NOT FORGETTING THE MORFA CONCERT, CLICK HERE TO VIEW!